Dental implants are substitutes for the roots of missing teeth. Implants act as an anchor for a replacement tooth or crown or for an entire set of replacement teeth. This is the most common type of implant. 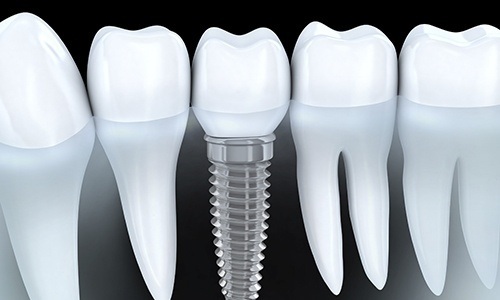 It is a screw type of implant, shaped like the root of a tooth, which is set directly into the jawbone under the gums. Implanting a root form implant is a surgical process which requires local anesthesia. It takes about three to six months for your gums to heal from this process. After healing, the implant is uncovered and a replacement tooth can be attached. A root form implant – also called an endosteal implant – is used when there is plenty of width and depth of the jawbone. 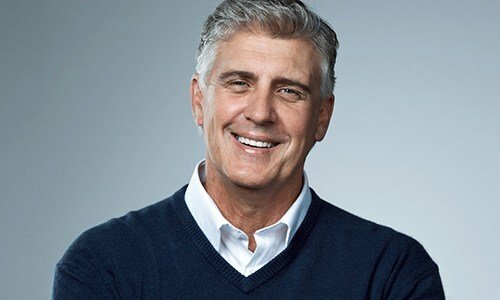 If there is jawbone deterioration (i.e., if your jawbone is too narrow or short), a root form implant is usually not the best choice. A plate form implant is used when the jawbone is too narrow or short for a root form implant. The plate form implant is a flat, long implant which is set directly on top of the jawbone and under the gums. Bone and tissue will eventually grow around this type of implant, making it more secure. This type of implant is also called an endosteal implant. The surgical process involving the implantation of a plate form implant is similar to that of the root form implant. Under local anesthesia, an incision is made into the gums, and the plate form implant is set on the jawbone. It takes about three to six months for your gums to heal, and after that, an abutment is attached to the implant. The replacement tooth, teeth, or crowns (depending on your needs) is then attached to this abutment. Some plate form implants, however, do not require the long healing process and are immediately ready for restoration. Each individual is different – only a qualified cosmetic dentist can tell you which type of implant is right for you. A subperiosteal implant is used when there is not enough bone width or height for either root or plate form implants. If there is not enough jawbone, a custom-made implant must be created. This custom-made implant acts, in a sense, as an artificial jawbone, attaching to your natural jawbone and enhancing its surface area. Like the plate form implant, the subperiosteal implant rests on top of your jawbone and under your gums. However, unlike the plate form implant, the subperiosteal implant first requires that an impression is made of the area of your jawbone where the implant is going to be placed. There are two methods to obtain this impression. The first method is a surgical procedure and requires anesthesia. Your cosmetic dentist will make an incision into your gums and take an impression of your exposed jawbone. The impression is sent to a dental laboratory, and a custom-made implant is created. About two weeks later, this custom-made implant is placed on your jawbone in a second surgical procedure, which is similar to the one used to place both root and plate form implants. After your gums have healed, replacement teeth are then installed into this custom-made implant. The second method of subperiosteal implant placement does not require surgery to create the impression of your jawbone. Rather, a CAT scan is used and, through computer modeling techniques, a model of your jawbone is made from this information. The model is then sent to a dental laboratory and your custom-made implant is created. 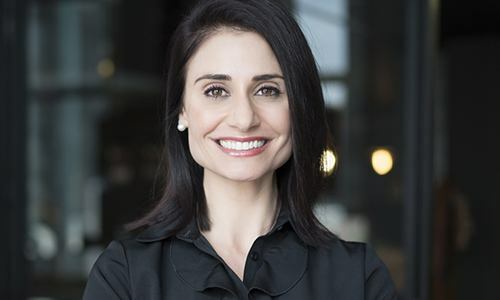 Dr. Alex Naini has many years of experience restoring all types of dental implants, and she’ll make sure your new smile is always strong, durable, and completely natural-looking.